Machine learning (ML) techniques could improve healthcare monitoring for the chronically ill. Now metrics can be measured without contacting the patient whatsoever. 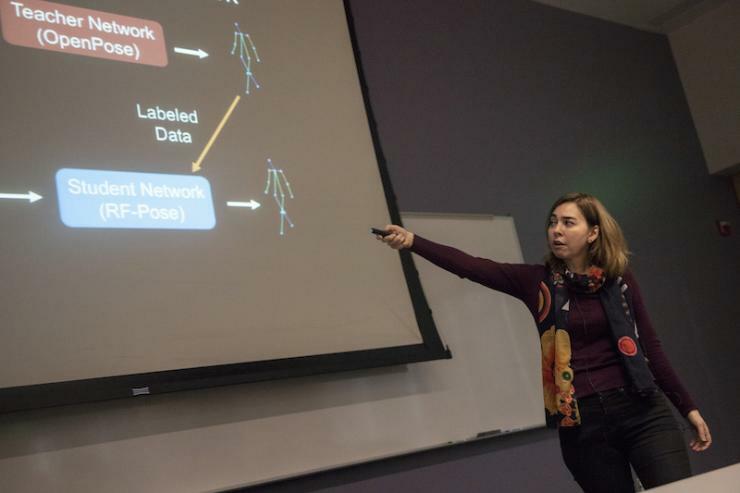 Dina Katabi, a Massachusetts Institute of Technology professor, gave the School of Computer Science’s distinguished lecture on this topic, Deep Learning Models for Tracking People through Walls and Sensing their Vital Signs, on Nov. 8. Although it’s easy enough to measure reflection time off the human body to determine if a person is moving, currently it’s harder to measure actual actions or poses. Reflections are a fallible measurement tool because most body parts don’t register and secondary reflections can muddle data. However, human motion across time can be measured. This is where deep learning comes in. A neural network can fill in the missing information and create a body part that didn’t register during the first radio frequency reading. Once the neural network is trained on some data, a camera isn’t even necessary. “The network can see through walls even if we can’t,” Katabi said. This is more than just a theory. Katabi and her research team have put it into practice. They trained the neural network on 50 hours of data over 50 locations, capturing daily activities. Then they applied the data to healthcare issues. Katabi found that the neural network can determine a person’s breathing with 97 percent accuracy compared to the FDA-approved chest band. Sleep disorders can be analyzed with 80 percent accuracy. This is ground-breaking because these metrics are typically measured with invasive chest bands or wires that are uncomfortable to the patient. Ultimately this could revolutionize healthcare spending. Chronic conditions drive up healthcare costs because people usually seek treatment when they are most extreme. Using radio frequencies to monitor conditions like Parkinson’s or congestive heart disease could enable doctors to intervene before hospitalization is required. They have already deployed the technology to 200 homes.